MORE and more Americans are taking to the road on two wheels. Between 1977 and 2009 the total number of annual bike trips more than tripled, while the bike’s share of all trips rose from 0.6% to 1%. Commuting cyclists have also increased in number, with twice as many biking to work in 2009 as in 2000. Cities are increasingly vying to be bike friendly. Among them, Chicago wants to become the most cycle-friendly large city in the country—and has said it will build over 30 miles of protected cycle lanes this year. At the moment it ranks fifth, according to Bicycling magazine. Ahead of it are Washington, DC, Boulder, Colorado, Minneapolis and Portland, Oregon. And cycling is growing fast in all these cities, as it is in New York and San Francisco. 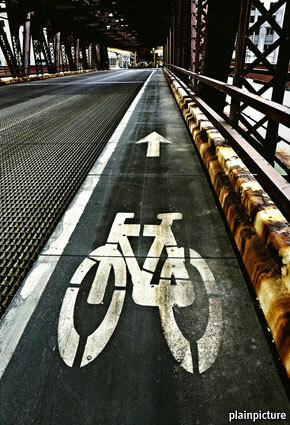 The growth comes thanks to cycle-friendly policymaking and increases in government spending. In Portland, which brought in a comprehensive programme, cycling levels have increased sixfold since the early 1990s. In Chicago the motivation is to improve the quality of life, and thus encourage both businesses and families to move there. In a forthcoming book, “City Cycling”, John Pucher and Ralph Buehler argue that the bike boom needs to be expanded to a broader cross-section of people. Almost all the growth in cycling in America has come from men aged 25-64. Rates of cycling have actually fallen slightly among women and sharply among children, most probably because of nervousness about safety. But in fact cycling is getting safer all the time. According to a paper* by Messrs Pucher and Buehler with Mark Seinen, fatalities per 10m bike trips fell by 65% between 1977 and 2009, from 5.1 to 1.8. In their book, the authors claim that the health benefits of cycling far exceed the safety risks. Chicago is also planning one of the largest bike-sharing programmes in the country, with 3,000 steeds. Bike-sharing increases the number of trips by bicycle in a city and improves the cycle culture. Growth in cycling is also spurred by weekend closures of streets to motor vehicles and mass cycling events. All these look likely to become more common in America. As 48% of trips in American cities are shorter than three miles, there is big potential for further growth. Yet while the future looks bright, America will struggle to catch up with northern Europe, where the proportion of local trips done by bike can be as high as 30%. One reason for this is that car ownership remains far cheaper in America. Another is the absence of restrictions on car use, which would greatly improve cycle safety. Europeans are far keener on traffic-calming measures, car-free zones, fewer parking spaces and road “diets”—where cars are allocated a narrower piece of road. America may be flirting with the bicycle, but it has by no means ended its long love affair with the car.